Like so many others who go looking for love on Internet dating sites, Annette was lonely. John was everything a lonely woman could want. He was attentive, sent lots of text messages and e-cards and even called Annette's cell phone. He even said he was a millionaire. Everything was fine until John said the customs agents at the airport in Nigeria confiscated his luggage for a week containing his $45,000 in travelers' checks, he told Annette. He just needed $1,300 to get him and his daughter by for a week. Annette didn't think twice about helping the man of her dreams. But John's situation worsened by the day after that. His luggage was stolen, his daughter was kidnapped, they were ambushed by thugs and by the end of it all in June, Annette had wiped out her life savings by wiring $36,300 not to mention $733 in wire transfer fees -- to Nigeria. John kept pushing until she had nothing left to give, said Annette's brother, Warren, who spoke on the condition that he and his sister's full identities would not be published for fear of shaming their family. Warren spoke for Annette because she was too embarrassed to be interviewed by ConsumerAffairs.com over the phone. In saved chats Annette provided, John wooed her by calling her cutesy names and making promises of a life together. Despite his terrible grammar and her hesitancy later in their relationship, she still gave him everything he wanted. Honey,i just wanted you to know the sitaution here is getting worse and i've negotiated with the man that brought me back to Africa, John wrote. He said i should bring the sum of $2600 before i would be able to sign the document belonging to my house. ... Honey i know i'm causing you alot of stress but i want to promise you this problem i'm facing here will end in time. ... I want to spend the rest of my life with you and Hailey. He repeatedly promised he would pay her back in full with interest. John made repeated comments about God and going to church. I believe the almighty God will see both of us through, he wrote. When she balked at his requests, John would say, If you don't give me the money, it means you don't love me, Warren said. Although Annette's case may be the most extreme, it's not the first. ConsumerAffairs.com has received at least 20 complaints from consumers who fell or nearly fell for scammers they met on online dating sites. I met someone whom I thought was special and he turned out to be a con artist from Nigeria who asked me for $300, Minerva of Long Beach, Calif. wrote. That was not an isolated incidence. These predators contacted me about eight different times on Match.com, but I learned from the first one. In October 2006 ConsumerAffairs.com published the story of Eduard of Mantua, N.J. who wired $13,000 to a woman in France he met online. Mark Brooks, editor of the Internet dating publication, OnlinePersonalsWatch.com and a consultant for the industry, said every dating Web site has problems with scammers from all over the world. This is organized crime, Brooks said. This is not necessarily individuals out there. They are targeting lots of different industries, but idating is one of them. They have it down to a science knowing what threshold people will take. Many of these scammers work together to create enormous fraud rings and share data on how best to scam people, said Scott Olson, vice president of marketing for iovation, a company that tracks computers so that Web sites can block devices that have a history of being connected with fraud. We've seen fraud rings that have hundreds of accounts per device that they basically are repeating their scams over and over again with many different people, Olson said. These are organized fraud rings that do this as a big business. They have a formula very much like telemarketing where they have a script. Brooks said he has spoken with many consumers who have been the victim of fraud on Internet dating sites. You look at these cases and you think 'how could anybody be daft enough to part with so much money?' But one only needs to talk to these victims one on one to realize that these are vulnerable people and these people open up their hearts and minds to meeting new people and trusting Internet dating sites with these very precious things, Brooks said. Scammers sometimes take several months to develop relationships before they start asking for money, Brooks said. They're very good at pulling on the heartstrings, Brooks said. They want to get as much emotional connection with their victim as quickly as possible so they can convert them to whatever scam they want to. The main thing is that they want to open up the wallet as soon as possible and as soon as they have the wallet open for any amount ... then they know they can extend that and they can keep upping the ante. Besides Nigeria, Brooks said Russia is also on the cutting edge of online date site fraud. The males tend to fall for the picture of the beautiful Russian woman and they get to the stage that they want to fly her into the country, she can't buy a ticket on her side ... so he'll spring a thousand plus dollars to fly her from Russia, (he waits) at the airport and no one shows up, Brooks said. That's a very common scam. Eharmony.com vice-president of corporate communications Fiona Posell said the company is not responsible for any money its consumers lose to scammers that Eharmony.com matches them up with. We are very clear with our users, but ultimately it's their responsibility and with many things, finding a relationship is an emotional experience and judgment can be clouded and that's why we tell them to follow the guidelines we give them, Possell said. Eharmony.com relies on its network of 20 million users to turn in those who break the rules so representatives can remove them, Posell said. In the case of John, Eharmony.com discovered he was using a stolen credit card 15 days after he signed up and notified Annette three days later on March 14, three days before she wired John the first loan of $1,300, Posell wrote in an e-mail. This is a very unfortunate, very unusual case and we feel really bad about it, Posell said. 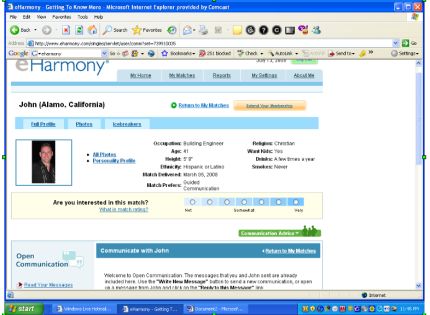 Eharmony.com clearly states on its Web site that it does not perform background checks. There is no way to do that with complete certainty that it can be done in a way that wouldn't convey to our users some sort of safety net that we can't provide, Posell said. It's very hard to perform a background check on an individual to the extent that you would want to. We are very clear that we don't do that. Some Web sites do offer background checks, but Brooks agreed with Posell that most background checks would be costly with little increase in safety. They inspire a false sense of security, they don't really work that well and they kind of cost a lot, Brooks said. A very basic background check costs about $10, Brooks said but warned that most scammers would still be able to get around that layer of security. If you did a real background check that actually did sophisticated phone verification and friend verification and other things like that, it would be so cost prohibitive the industry couldn't even exist, Brooks said. Everyone ConsumerAffairs.com interviewed for this story said consumers should never give any money to anyone they meet online and that's why Warren said he doesn't completely blame Eharmony.com for what happened to Annette. Ultimately, it's my sister's fault, Warren said. I believe people should take personal responsibility. Maybe (Eharmony.com) was a bit too lax, but at the end of the day, we should all be grown ups. ... We should be smart enough, mature enough and wise enough not to fall for these things.